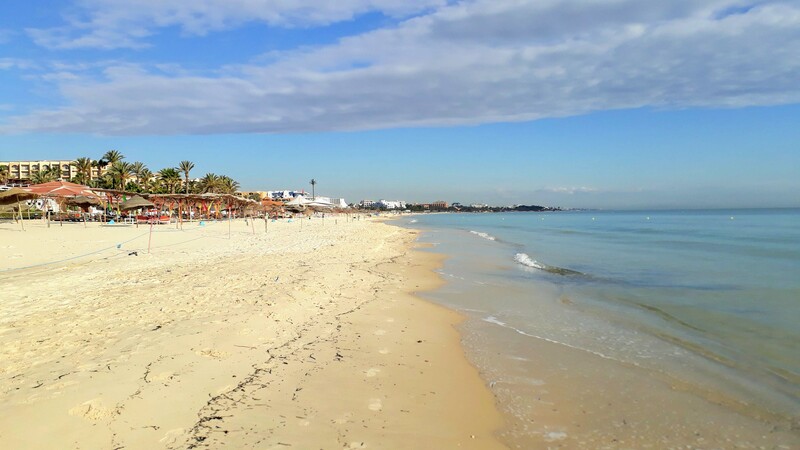 The third largest Tunisian town of Sousse is located on the Mediterranean Sea and is one of the country’s most famous tourist destinations, in particular for its beaches. With the Great Mosque, the ribat, the kasbah and one of the most original souks in Tunisia, the Medina of Sousse has been a UNESCO World Heritage Site since 1988. We spent a month in the port city and want to show you some of our impressions in this post. The history of Sousse dates way back: The Phoenicians founded the city about 900 BC under the name of Hadrumetum. After the Arabs almost completely destroyed the city in the 7th century, it was re-established at the beginning of the 9th century under the name of Susa. The foundation stone for today’s old town, also called medina, was laid. Today, Sousse has 221,530 inhabitants (census of 2014). Almost half a million people live in the metropolitan area. 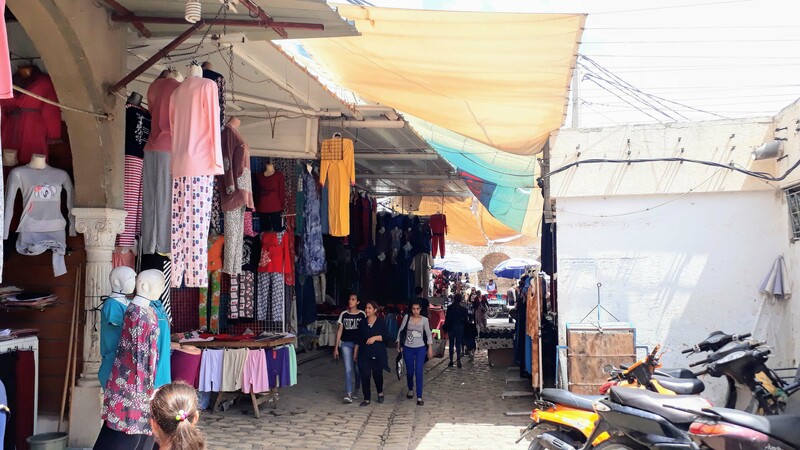 Especially worth seeing is the medina. 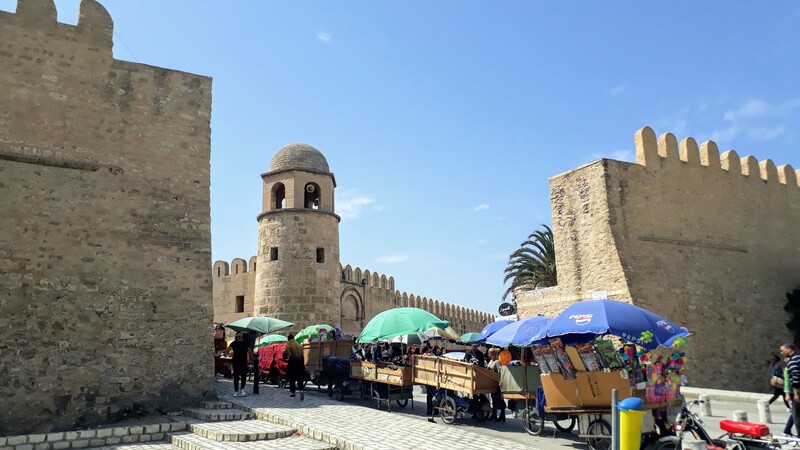 Within its 2.25-kilometer-long city wall are located next to the many Arab bazaars (souks) the Great Mosque, the ribat and the kasbah (Arabic name for a fortress located inside or outside of cities). The Great Mosque was built around 851 and expanded several times between 894 and 897. A dome pavilion on the northern corner tower of the mosque serves as a minaret, a later addition from the first half of the 10th century. 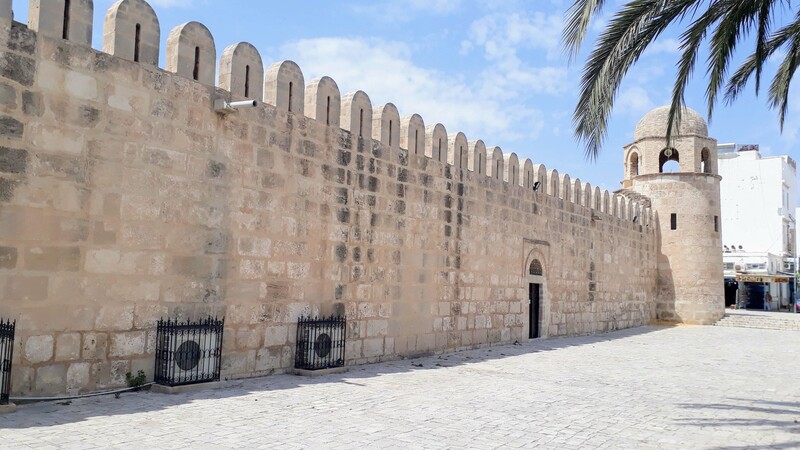 Due to its proximity to the ribat, the mosque has a compact design and therefore resembles a fortress more than a mosque. 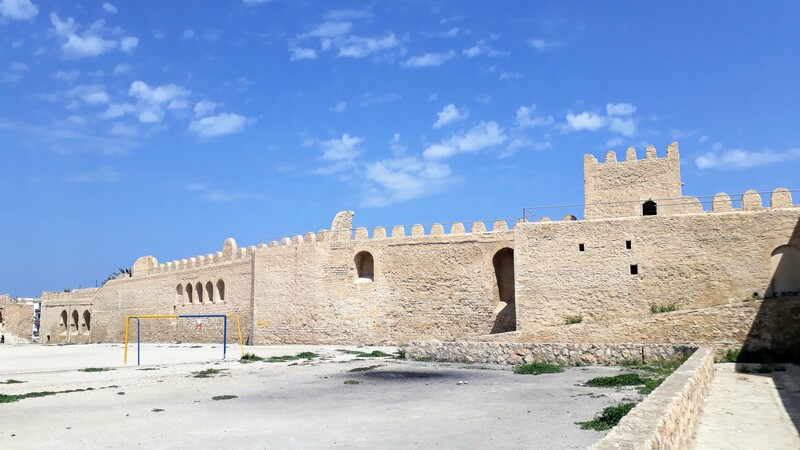 Under the name of Ḥiṣn Sūsa (“Fortress of Sousse”), the ribat was created in 821. The building with six corner towers and a 27-meter high watchtower was originally used to prepare for military campaigns and as a refuge, but gradually lost its military function since the construction of the city wall in 859. Today, the watchtower can be climbed via a narrow spiral staircase and offers a view over the medina and the port of Sousse. With the international student card ISIC, admission is free as with most Tunisian attractions. 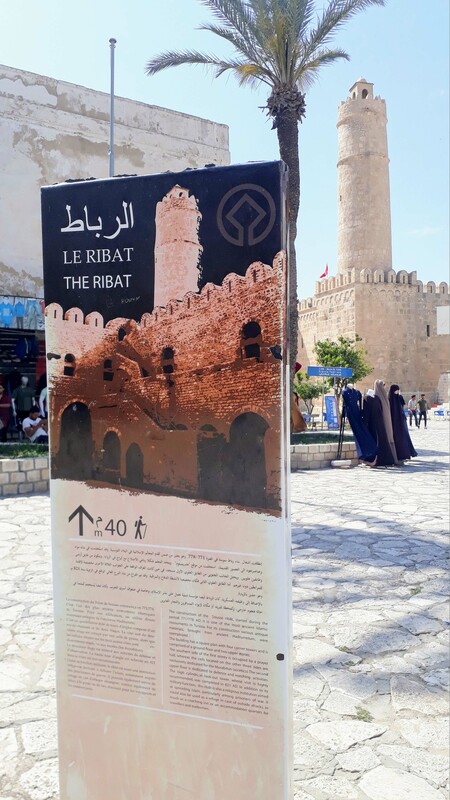 Otherwise the ascent of the Ribat costs 7 TND. Photo permission requires an additional Tunisian dinar. The kasbah (medieval fortress) was built in 844 at the highest point of the medina. In 853 a 30-meter high lighthouse was added. Today it houses the Archaeological Museum of Sousse. With its Punic, Roman and early Christian exhibits, it is one of the most important museums in the country. 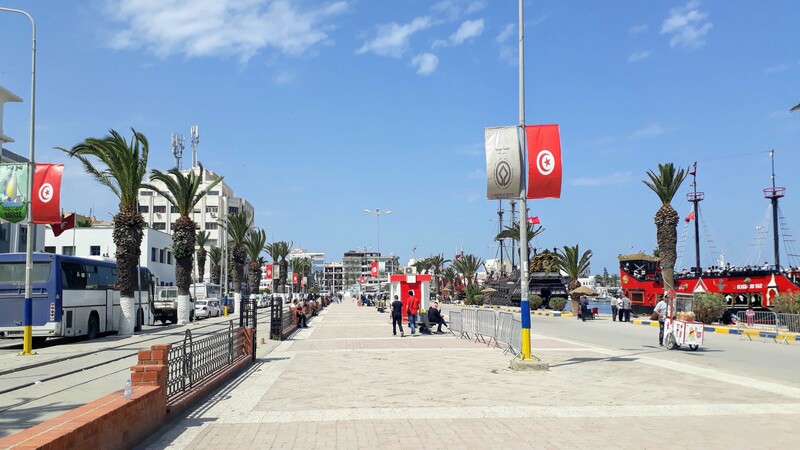 Also worth seeing is the harbor and beach promenade, which extends along the port from 1899 on the eastern edge of the medina to the beaches and hotel complexes in the north of Sousse. 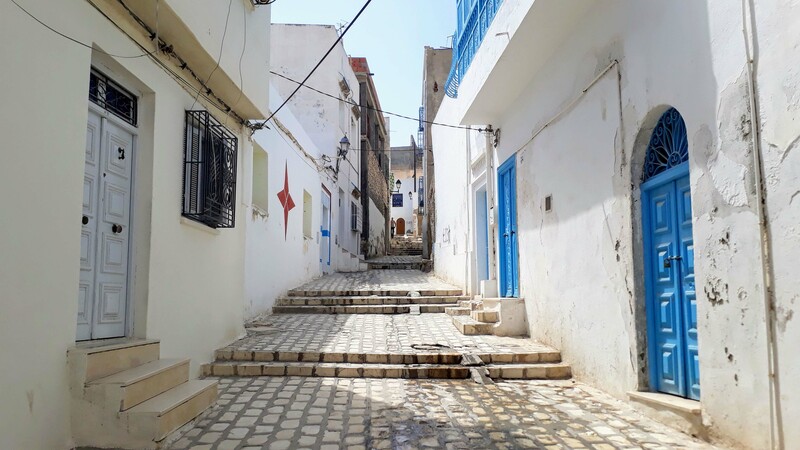 It leads to Port El-Kantaoui, an artificially created “pleasure town” less than 10 kilometers north of the Medina of Sousse with numerous restaurants, luxury resorts, souvenir shops and all sorts of street vendors. 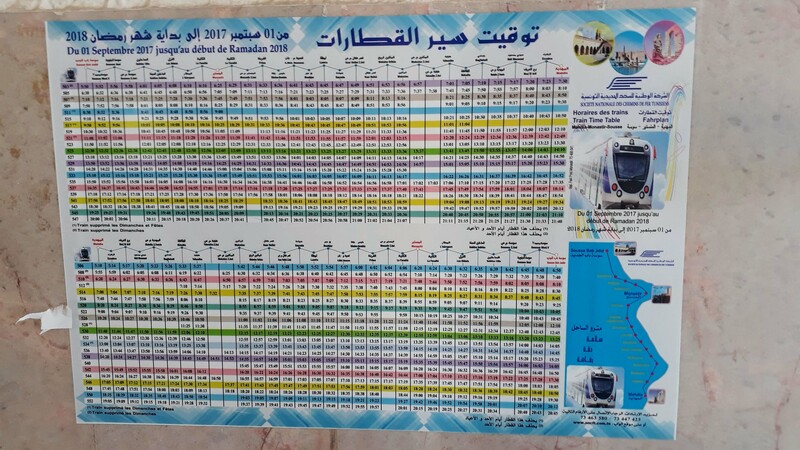 Sousse is very easy to reach by public transport. 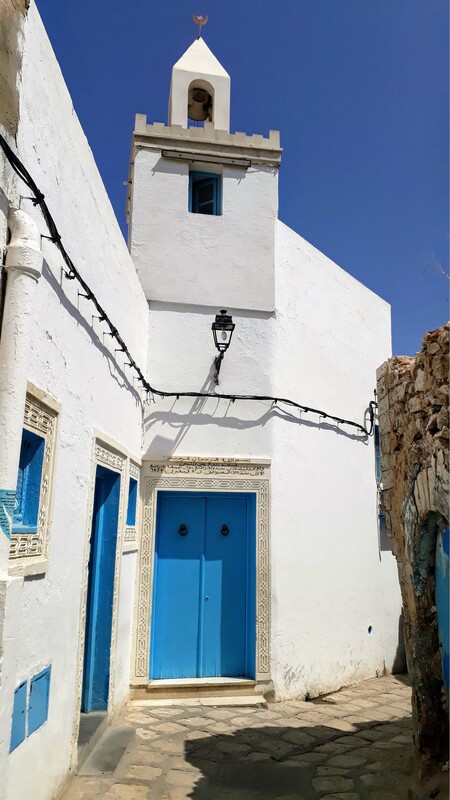 By plane, you can get to the city via Monastir Airport, 10 kilometers away, or Enfidha-Hammamet Airport, which is about 30 kilometers away. Several trains run daily on the Ligne de la Côte, the main route from Tunis to Sfax, where inbetween also Sousse is located. The railway company is called SNCFT (Société Nationale des Chemins de Fer Tunisiens) and also operates the light rail line Métro du Sahel along the Mediterranean coast. 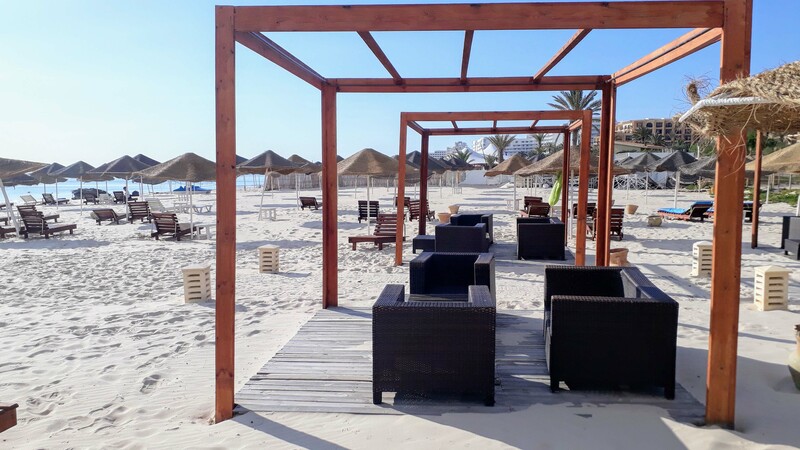 It connects Sousse via Monastir with Mahdia (total travel time 100 minutes, total fare 2.5 TND). In addition, Sousse has a Louage station. 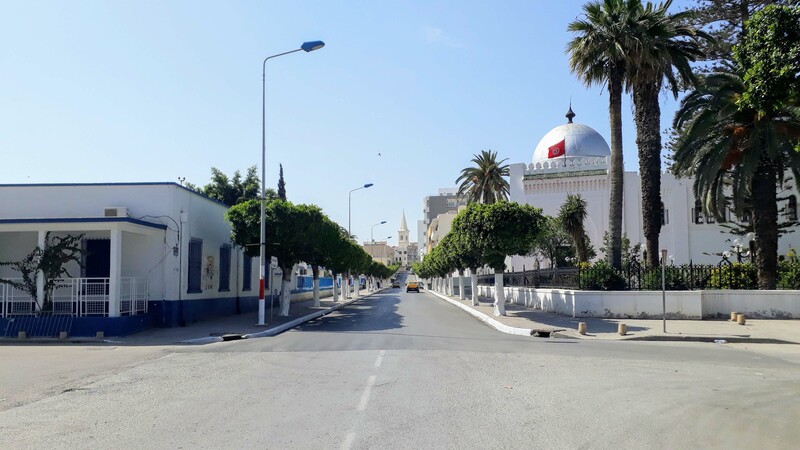 The shared taxis travel daily to Tunis, Monastir, Kairouan, Sfax-Gabès, Kasserine, Gafsa and the surrounding settlements. 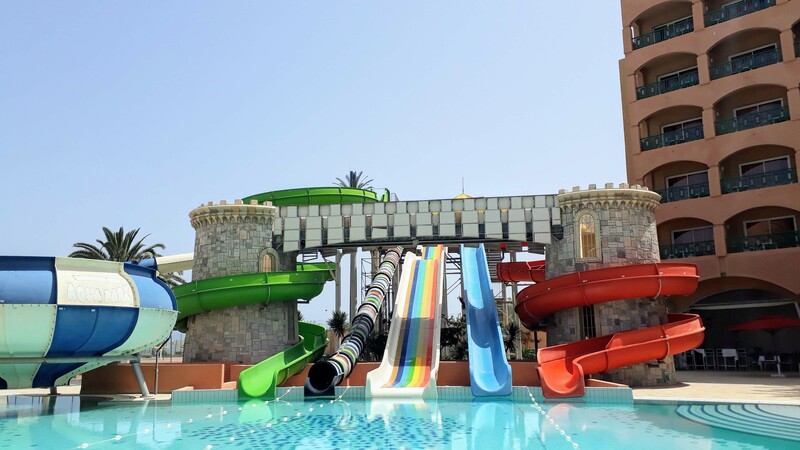 Due to a cheap package travel offer we decided for the Hotel Marabout Sousse. There we spent 28 days including half board. Actually, package holidays are not our thing, but we wanted to bridge the gap between Egypt and Cyprus. So we spent the time in the hotel mainly with work (online) and only took a few days trips. The 3-star hotel has an indoor and outdoor pool with slides, which unfortunately we could hardly use considering the weather. It also has private beach access. We especially liked the location: The Medina of Sousse can be reached in half an hour on foot via the beach promenade. As expected, the restaurant offered pretty little vegan choices. So we took our own soy milk for breakfast. At dinner we asked each time the chef which dishes would be suitable for us. Since neither veganism nor vegetarianism is well known in Tunisia, we simply explained what we don’t eat. Due to the fact that the food of the buffet was different every day, we still had enough variety. I have lived in Hammam sousse Tunisia after many visits to this beautiful country plus I have worked on a Roman dig near to enfidha airport finding gold and human bones as well as broken pottery and mosaic.